With the assistance of our effective workforce, we have the capacity to give high quality Semi Auto TTR Slitterribbon Saving Machine that is produced with precise quality control methods and in line with international standards. These machines are generally utilized for slitting and rewinding of different move material, for example, PET, Paper, CPP, BOPP and Aluminum foils. 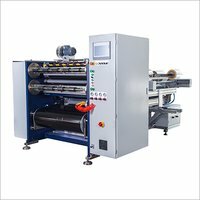 With rich industry understanding, we are included in giving our customers a premium evaluation scope of TTR slitterribbon saving machine which is quality guaranteed and effectively working for a longer period of time. Our raw material, which is acquired from the legitimate vendors of the business sector is utilized to make this machine is tried by our quality controllers on characterized parameters.